Your home’s comfort is only as good as the products you use. That is why we at Logan A/C and Heat Services work with top manufacturers such as Trane, Rheem and Mitsubishi Electric. You will be delighted to see what a good heating and cooling system can do for you. We can help you find the appropriate unit that will provide ideal cooling for your home and suit your budget. We are happy to provide the information you need to make an educated decision on your home heating purchase. Discover how a new heat pump could make every season that much more comfortable. 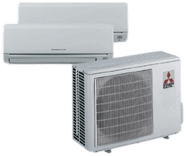 A ductless system installed by Logan A/C and Heat Services is just the ticket for better comfort and efficiency. Indoor air quality affects your health, not just your comfort. Removing contaminants from the air in your home is highly achievable with the many clean air products we offer. You might be surprised how much better this addition to your HVAC system can make you feel. Ever head out on a trip and realize that you forgot to change the settings for heating and cooling? With Nexia Home Intelligence, you can have smart home automation that puts the control in your fingertips. When you arrange for installation of these products through Logan A/C and Heat Services, you get professional attention that puts your needs at the forefront. For the past 50 years, we have established a reputation for fast and friendly sales, installation, and service for all our Ohio customers. If you are looking for a great air conditioner or furnace for sale, you can find it here!